You can assign the name you wish to associate with the group of people/events who will be in this photo gallery. You may have multiple galleries. In the description you may enter a description of group of people/events included in this gallery. Again, you have the security radio buttons at the bottom. This allows you to page, forward and backwards, through each photo in the gallery. The "Return to Photo Galleries" returns you to the list of galleries in your directory. 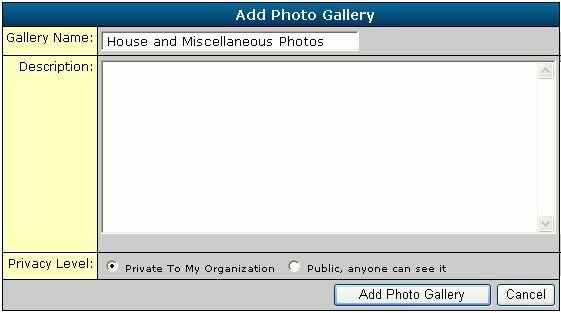 The name of this photo gallery is House and Miscellaneous Photos and this is where you will upload the pictures from your PC into this particular photo gallery. To get the photo into this gallery, click on the browse button until you find the appropriate picture on your PC. 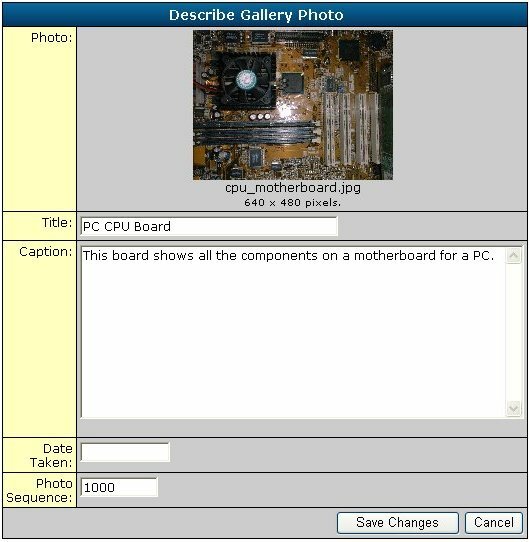 An important thing to know is that if you randomly chose your sequence of putting pictures into the gallery, that is the sequence they will appear to the end user when they page through the gallery. I will now upload a picture and display it so you may understand how this process works. 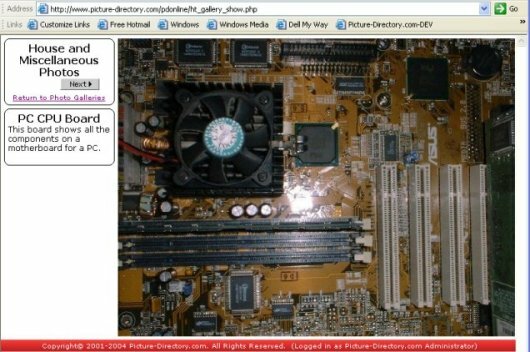 I have uploaded a picture of a PC CPU board into the House and Miscellaneous Photos gallery. You will notice that the radio button has shifted to the next available slot, which is at the end and therefore will append the next picture to the end. I have then uploaded a picture of a house, which is appended to the first picture. If I wish to insert another picture between the CPU and house picture, I must click on the radio button over the house. You can see the information entered for the CPU. Some information has been entered for this example. You will view the following when you click on the name of the gallery (House and Miscellaneous Photos) which is the first picture in the sequence.